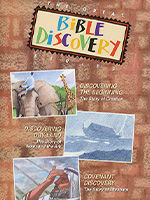 Learning the Bible becomes an exciting adventure with the Great Bible Discovery Series. Join host David Mead as he guides the way through classic stories of the Scripture, explaining the action and posing questions in a fresh, entertaining way. 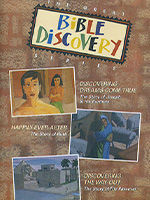 Each of the three episodes features a lively interactive approach with live action mixed with storybook style animation. Discovering the Baby King -- The Story of Christmas follows the search for the baby Jesus from the prophets of the Old Testament through the hunting of King Herod. Discovering the Beginning -- The Story of Creation recounts the miraculous creation narrative from the electrifying power of the first flash of light through the tragic fall of paradise. Discovering Dreams Come True -- The Story of Joseph and His Brothers follows the remarkable life of Joseph, whose forgiveness and faith in God saved his sometimes jealous family. Happily-Ever-After Discovery -- The Story of Ruth focuses on the faithful heroine Ruth, whose life of love and loyalty serves as an example to everyone in God's family.